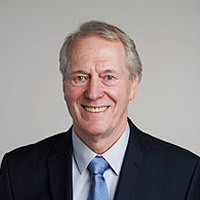 Allan Balmain is the co-leader of the Cancer Genetics Program and is the Director of Genome Analysis Core Facility at the UCSF School of Medicine. Balmain researches cancer by using mouse genetics to understand the relationships between exposure to environmental carcinogens, including chemicals and radiation, and cancer susceptibility. His lab has generated mouse models that recapitulate the genetic heterogeneity in human populations, with a view to develop approaches to personalized diagnosis and treatment. The focus of his most recent projects is the development of “Systems Genetics” approaches to analysis of normal tissue biology, and the changes in the genome mutational landscapes and gene expression architecture that are induced by carcinogen exposure. Balmain’s analysis of mouse tumors induced by different carcinogens will provide a deeper understanding of the etiology and mutational origins of human cancers.